The Children’s University is a charity that provides children aged 5 to 14 with the opportunity to take part in exciting, interactive and voluntary learning activities, outside of normal school hours. Children collect credits and gain certificates while they learn. The Charity holds Children’s University graduations, at real grown-up universities, with real caps and gowns. Taking part lets children explore different learning environments, and become independent and confident learners.The Charity’s aim is to raise aspirations, boost achievement and instil a love of learning that will stay with children throughout their lives. As a recognised Learning Destination, the Heroes Centre offers a high-quality, fun, innovative and engaging learning experience for children. 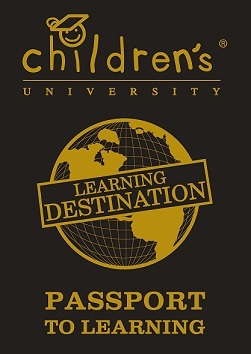 Children can enter the Centre, take part in an interactive activity and on succesful completion will have their passport stamped, earning them a Children’s University credit. Children taking part at the Heroes Centre will complete an activity called ‘What Makes a Hero?‘ and it encourages then to learn about the people with connections to the town and to consider what qaulities make a Hero. They are encouraged to nominate their own Hero and provide the reasons for thier choice. The activity is Free to Children’s University Scotland Passport holders.